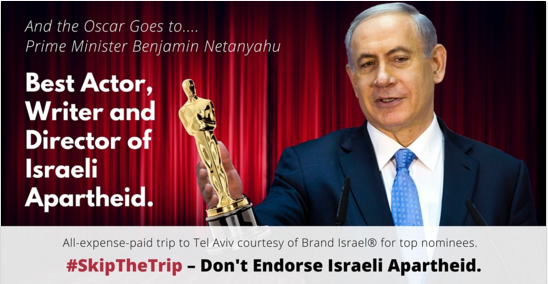 This week we saw how American corporate media has a long way to go in representing us fairly as Variety magazine censored an ad calling on Oscar nominees to reject Israeli apartheid. In the end the ad was placed in the LA Times and the controversy amplified our message even more. Let’s take to social media this weekend as the media’s attention turns to the Oscars ceremony. Celebrities are not easy to reach and social media can help get the message directly to them. Thank you to those who signed our petition to nominees. Thousands have already signed, and if you haven’t yet please clickhere to add your name. ps: follow us on twitter and facebook - we will be taking part in the action this weekend too!